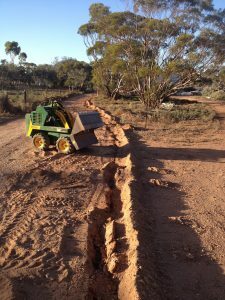 Don’t be the trenching attachment, hire one with your dingo! If you have no less than 10 metres of trenching to undertake, it is difficult to not consider the advantages of hiring a machine for the work. I’m considering it from a time/economic perspective, which doesn’t cover all the values. But they are the big ones. So this is my rationale on the time and economics of trenching. Economics: If you want to avoid the pain and employ someone else or put a value on your time then it costs you money to dig that trench. My experience shows me that this task won’t cost much less than $30 per hour. That is unless you can take advantage of paying your children under the award rate! With this in mind $30ph times 8 hours gives us $240. With these estimates in mind you can also safely assume you’ll be close to demoralized if you dig by hand. With a machine you won’t break a sweat and you can listen to your favourite 70’s music…with a smug smile on your face! What ever your choice we would love to add life to your backbone and wallet. 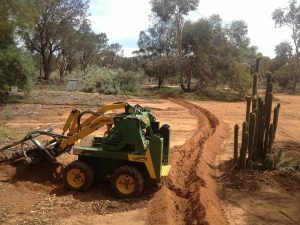 Next time you need that water, electrical or gas buried underground, hire a dingo with a trenching attachment. If you are searching for Adelaide Mini Digger Hire for trenching, We have the attachment to suit. Take a look at the range of possibilities here.